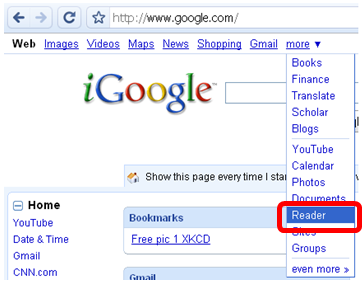 In this tutorial, we are going to learn how to use Google Reader to subscribe to a blog or website. Before you can do this, first you must have a Google account and second, the website that you are subscribing to must have RSS feeds. Blogs, pages, or websites with RSS feeds usually have RSS icons (see number 2 below). 1. Log-in to your Google Account and go to the Reader page. 2. Go to the blog that you want to subscribe to (you’re already here) look for the RSS Feed button and click it. 3. This will bring you to the RSS window. Copy the feed URL or web address of the Mathematics and Multimedia blog. 4. Go to the Google reader window and click the Add Subscription button. In the Enter a search item to find feeds or paste a feed url window, paste the feed URL of Mathematics and Multimedia, and then click the Add button. The actual feed of Math and Multimedia is http://feeds.feedburner.com/MathematicsAndMultimedia. 5. Click the All Items link in the left pane and you will see the Mathematics and Multimedia feed or latest posts in your window. 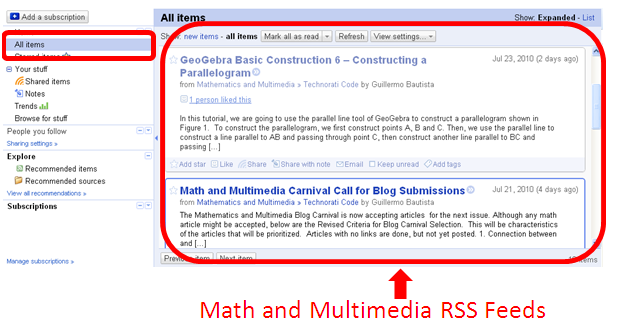 Every time Mathematics and Multimedia posts, it will appear in your Google Reader window.